While most people will shy away from talking about cruise food and might even say that they choose cruising for the itinerary or the ship, I’m not going to lie to you. I love cruise food. There — I’ve said it. First of all, I don’t love all cruise food. Due to my love of cruising, I do love experiencing all different kinds of cruise food. However, sometimes it’s nice to have a place to relax and enjoy your meal, that why it’s good to look around and find somewhere like one of the best restaurants downtown mall Charlottesville, so you can enjoy the atmosphere as well as your meal. I think of food as a sort of love letter from the cruise lines to their guests. If they really love you, the food is incredible. Yet, If they’ve got that seven-year itch and are looking for younger and less knowledgeable passengers, well — they don’t care and the food is often bad. The love letter I received from Fred. 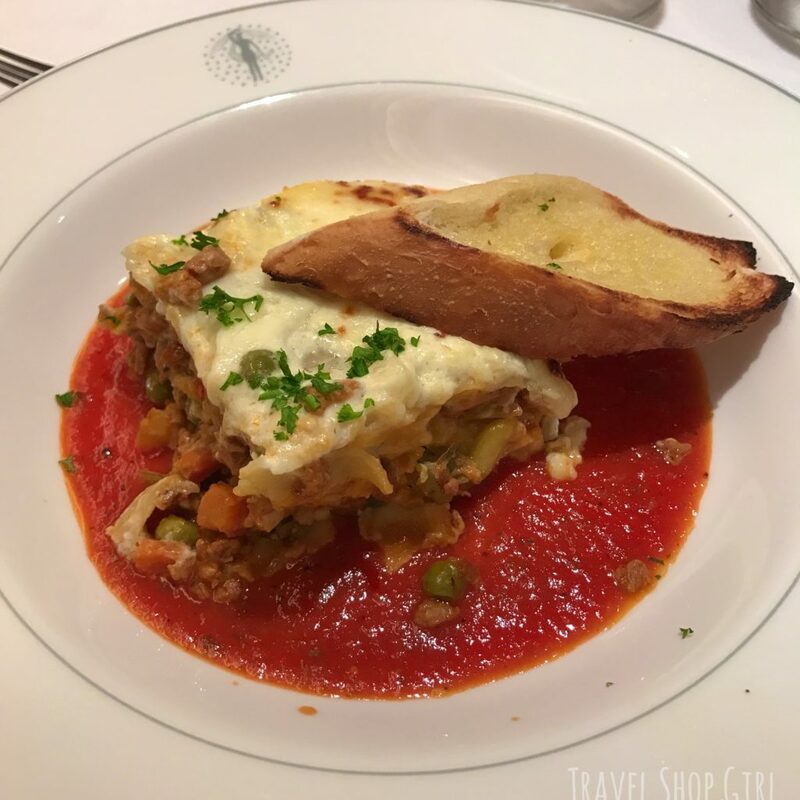 Olsen Cruise Lines recently when I sailed on Balmoral was so incredible, that it’s easy to say that Balmoral food was some of the best cruise food I’ve ever tasted. Interested in cruising with Fred. Olsen Cruise Lines? Read my Balmoral ship review earn more about my 14-day Mysterious Morocco & Seductive Spain cruise. There are three main dining rooms on board Balmoral: Ballindalloch, Spey, and Avon. While we were assigned to Ballindalloch for dinner, we could always dine in Spey for breakfast or a sit down lunch. We decided to try Spey on the first full day of our cruise. This was the area on Balmoral that was added during the refurbishment in 2003 prior to her joining Fred. Olsen Cruise Lines. As a result, the restaurant is light and bright with large windows. It also has a buffet area where you can help yourself to seafood, deli meats, crudities and dressed salad. For our lunch that day we ordered off the menu and I wasn’t feeling hopeful that I would find anything. Usually I end up eating salad, sides and pasta while on a cruise, but not on Balmoral. From the delicious vegetable broth with vegetables and barley to the crisp and delicious Caesar salad to which they added halloumi cheese, I was pretty ecstatic about the food early on into my cruise. Finally, to finish the meal off, I couldn’t resist dessert. How about a rich piece of chocolate cake? I was cautiously optimistic that they weren’t teasing me and would deliver food like this for the remainder of the cruise. Ballindalloch, located on Main Deck 6. We had a table for 2 next to a window where we could sit and peer out the window nightly. Either that or we would’ve been seated in a more high traffic area so this was perfect. With a five course meal offered a la carte each night, we could customize our meal and eat as much or as little as we liked. The wait staff was always checking back with us but was never intrusive or conversely, absent. On day two of our cruise we decided to sample the dinner offerings in Ballindalloch. From the soup to salad to entrée to dessert, I was never disappointed as every evening there was always a vegetarian option. This night I passed on the vegetarian option and decided instead on the Fusilli Pasta “Boscaiola” which was rich and super yummy. Who doesn’t love mushrooms? Main Courses: Norwegian Salmon in Champagne Sauce; Berlin Style Veal Liver, Braised Beef and Shallots; Smoked Mackerel and Grilled Aubergine. TSG Tip: You’ll notice as you scroll through this post that I had soup A LOT. The soup onboard was so good I didn’t want to miss out on trying any of them. As a result, I think the chefs onboard Balmoral should create a cookbook — the soups are that good. Poached Belle Helene: Poached pear, covered with hot chocolate sauce and toasted almonds, served with vanilla ice cream and whipped cream. On the third night of our cruise we once again visited Ballindalloch. On this night I chose the clear “Pistou” vegetable broth as my starter, which was really good. Again I passed on the vegetarian option and decided on the pasta dish from the “Always Available” menu, which also includes grilled fish of the day, grilled chicken breast, omelettes, and a selection of daily well done vegetables, French fries, boiled or baked potatoes. Dessert that night was a Poached Belle Helene, something I had never tried and was surprisingly delicious. During this cruise I was sick with a bad chest infection and laryngitis and didn’t eat every night in Ballindalloch. But near the end of the cruise I was feeling better and on day 12 we were back to see what was on the menu. On this night I was in heaven with a delicious starter of Cream of Roasted Garlic Soup. Despite my hesitancy to order it, I’m so glad I did as it was so ridiculously good. I chose the vegetarian option of Filo Basket Filled with Mushroom Ragout and while the mushrooms were fantastic, I left the risotto to the side. I love the idea, but I think they should have called it rice as it just wasn’t creamy enough to be called risotto. Skip ahead to dessert and it was all chocolate, chocolate, chocolate with the Trio of Chocolate Mousse. They knew exactly what I needed to keep me quiet for the rest of the night because what woman could possible turn down chocolate, right? For our final night onboard Balmoral we dressed up for our last meal in Ballindalloch. The mood was festive and the food was beyond delicious. While you might think I’m exaggerating about the cruise food, I’m not. Yes, the Italian Bruschetta and the Tomato, Red Onion and Mozzarella salad were tasty and fresh, but the entrée truly knocked my socks off. Another day and another vegetarian option to choose off the menu. Today it was the Quorn and Vegetable Lasagne, which was the best lasagna I have ever had anywhere. I forced myself to stop eating because I wanted to polish the entire plate off because it was that good. Furthermore, the sauce was rich and tasty and the cheese layer was delicious and like nothing I’ve had before. TSG Tip: In case you don’t know what Quorn is, it’s a vegetarian meat alternative which is definitely more popular in the UK than the US and they have far more choices than we do like sausage, meals, etc. Vegetarian: Quorn and Vegetable Lasagne: Layers of roasted vegetables and Quorn between sheets of pasta, tomato and cheese sauce. Overall, the meals served in Ballindalloch, one of the main dining rooms onboard, offered the best Balmoral food onboard the ship and some of the best cruise food I’ve had anywhere. The one specialty restaurant onboard Balmoral is called The Grill. Located at the rear of Palms Café on deck 7, this restaurant does require a reservation and charges a surcharge, but it’s worth it. With views looking out toward the pool and beyond, meat and seafood lovers will rejoice when they take a look at The Grill‘s menu. Danielle more than enjoyed the seafood options, which included lobster tail, grilled jumbo shrimps, tiger prawns, halibut and salmon fillet as well as meat options like the sirloin, ribeye or fillet steak. As for me, I chose from the main dining room menu, thanks to our delightful and attentive server, Conrad. In addition to the regular menu, he had a few secrets up his sleeve. He suggested adding halloumi to the Caesar salad, which they sautéed for me, making it even more delicious. Carrot and Courgette Croquettes: Flavoured with coriander and covered with bread crumbs and sesame seeds. Served with seasonal vegetables and a rich herb cream sauce. My entrée that night was the Carrot and Courgette Croquettes, which was presented beautifully alongside the grilled asparagus and mushrooms I ordered a la carte. Since the food is made to order in The Grill, it comes out tasting fresh and made to order. Most of all, where else was I going to find Chocolate Fondant with Salted Butter Caramel Sauce? While I’d like to say I passed, I certainly didn’t. Sometimes the ship’s buffet is a perfect alternative to a five course meal. It’s either a sit down meal or a faster buffet. Either way, you don’t lose out on quality cruise food. As in the case of Palms Café, it’s perfect for breakfast, lunch or dinner. The wait staff is thoughtful beyond comparison. Seems like they do far more than asked of them. I often spotted them assisting passengers with their food to the table if they needed help. Most times I wanted to run in, grab soup, salad or a little bit of this or that, and get on my way. During the days that I was ill, the Palms Café was perfect as it was a no fuss kind of meal. Almost easier than a fast food restaurant. One day guests were treated to a massive paella in Palms Café for our dinner in Malaga. Hence the massive skillet in the buffet area. And I do mean massive. Toward the end of the cruise Danielle became sick. I offered to run and take pics of what was in the Palms Café so she could decide if she wanted to eat in there or Spey. Maybe that’s why I was awarded the “Friend of the Year” award. Ok, maybe not, but I should’ve been. In addition to all of the prepared entrée, there was always bread, deli meats and cheese, everything you’d ever need to make a salad, and dessert in Palms Café. Palms Café always offers a special vegetarian option for lunch and dinner. All you had to do was ask and it’s brought directly to your table. I enjoyed a few Indian options as well as a shepherd’s pie with Quorn. Consequently, I’ve never had so many great options available to me before. As a result, that’s why Balmoral food is truly some of the best. Took me a while to figure this out but there’s a coffee/tea service after breakfast and before lunch so if you miss breakfast you can still grab a few biscuits and tea to hold you over until lunch. There’s also a late night buffet for those who miss dinner or plan to stay up all night. A few times during our cruise we ordered room service for breakfast or tea, but once I actually tried to order dinner when I wasn’t feeling well. I say tried because there were no real vegetarian options and I didn’t feel like the tomato and mozzarella sandwich with pesto. I ended up ordering the cheese plate and asked them to not include any meat, which you can see they did anyway. Don’t worry as I picked at the cheese and dessert and went to bed. Seems like a nightmare for the vegetarian cruiser, but I got past it. In conclusion, There’s no surcharge for room service, the non-vegetarians options are plentiful, and service is quick. Probably one of the highlights of my cruise was the special white glove afternoon tea service in the Observatory Lounge that was offered twice during the cruise. We experienced it on day 13 of the cruise and it was made extra special with loose leaf teas, sandwiches, pastries, live music, and of course, fresh-baked scones. While there is a surcharge for this tea service, it’s absolutely worth it. Probably first for the food and the tea, but mostly for the view. Compared to other cruises I’ve been on, Balmoral food ranks as one of the best in my book. Because of the high quality and great tasting food, a staff that is friendly and professional, and every meal was always a memorable one. I hope this post makes you think twice about your ideas of what cruise food is like. Do you have a favorite cruise ship meal? If so, let me know in the comments below. Furthermore, don’t forget to check out other cruise tips and tricks here on the Travel Shop Girl website. Hi there! So I’m going on my first Fred. Olsen cruise in September (on Balmoral) and was really happy to find a review by an American. Sad to say that I happen to be one of the Americans that’s not a fan of British food so that is the one thing that scares me. Your review bolstered my spirits a bit. Great reviews!